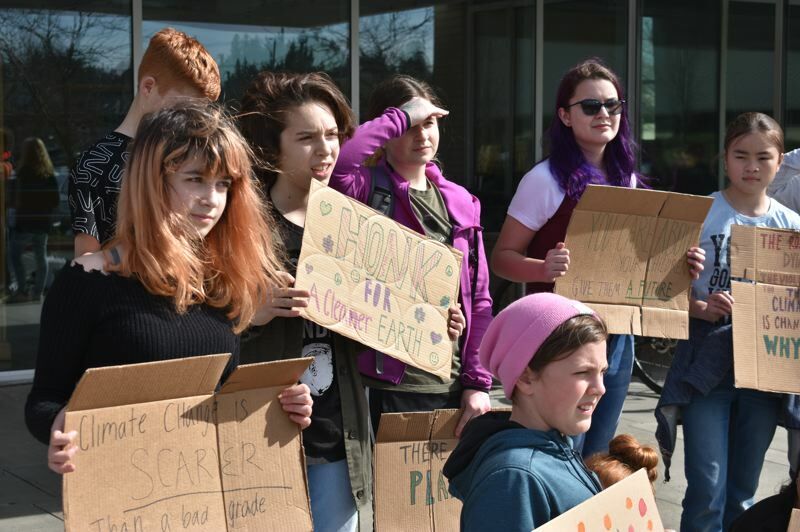 A small clutch of students gathered outside Gresham City Hall on Friday afternoon to join a worldwide movement of students rallying for action on climate change. 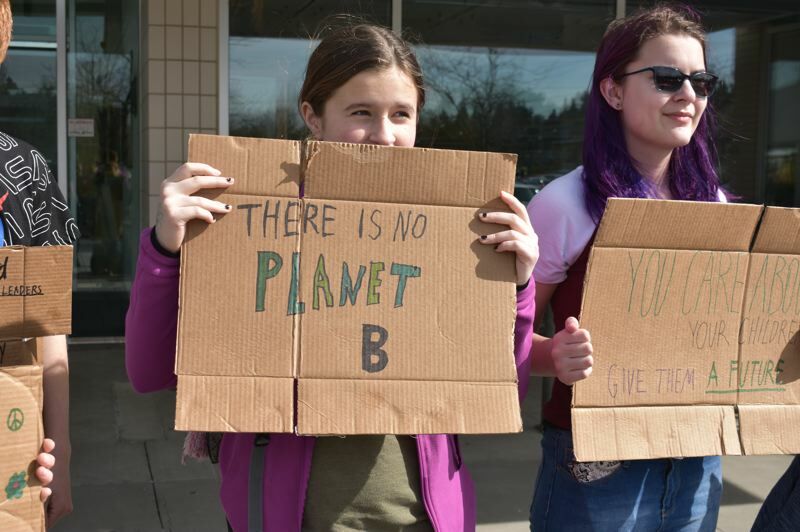 The students, seventh and eighth graders from Lewis and Clark Montessori Charter School, Damascus, held signs made from used cardboard boxes with slogans about saving the environment. The Gresham demonstration is part of the Fridays for Future demonstrations that took place around the world Friday, March 15. "We're trying to bring attention to climate change," said Luna Meza, a Lewis and Clark seventh-grader. Another student noted "this is where we will be living for the next 70 years." Most students said their parents backed their action. "My parent are very supportive," said Benjamin Roberts. 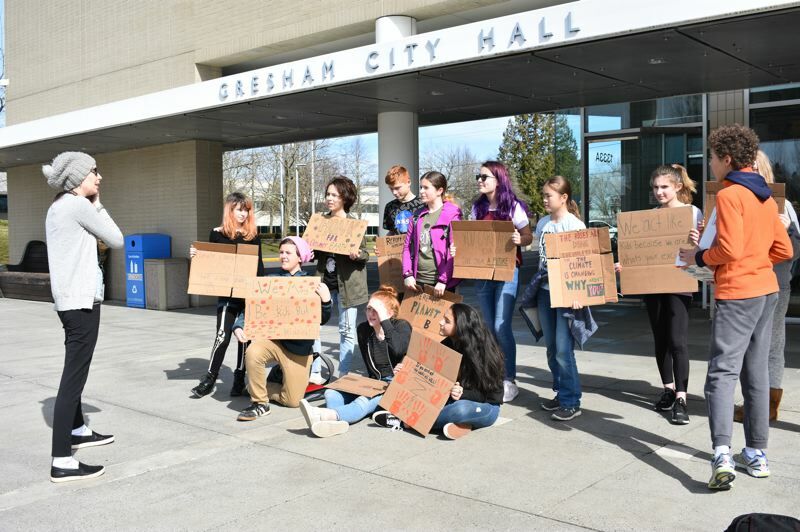 Shaunna Sutcliffe, residential recycling coordinator for the city of Gresham, came outside to the front of City Hall and listened to students' concerns and suggestions. Sharing some of the things Gresham is doing to improve the environment and help combat climate change, she encouraged the students to "keep using your voices," but also suggested things they could do themselves. The Lewis and Clark students left school a bit early for their afternoon rally in the sun, unlike some students who took most of the day off. They said they feel their school is part of the solution and doing a lot to benefit the natural environment. In Portland, about 1,500 students from various schools gathered in front of Portland City Hall on Friday. The Fridays for Future movement was inspired by Swedish school girl Greta Thunberg, who sat outside the Swedish parliament holding a sign that said "school strike for climate" last August when Swedish school is in session.